Aker Energy has officially announced a $4.5 million dollar support for the Accelerated Oil and Gas Capacity-Building (AOGC) Programme to provide training to thousands of Ghanaians for five years. About 30 percent of the trainings are targeted at women. The AOGC Programme was established in November 2017 by the President Akufo-Addo-led New Patriotic Party (NPP’s) Government, with the intent to enhance the capacity of Ghanaians to enable them to work in the oil and gas sector. The AOGC initiative would be in effect for five years and it aims to train Ghanaian youths in technical and vocational areas. In addition to the training, the programme will provide business and management training for small and medium enterprises (SMEs) and ensure the continuous professional development of employees of various public institutions connected to the oil and gas industry. Aker Energy’s focus areas under the AOGC Programme include training Ghanaians in the industry, building capacity in educational institutions, development of SMEs and training of Government of Ghana officials. A total of 150 SMEs are expected to receive capacity building annually through the Programme. The objectives of the Programme are to aggressively invest in education and skills enhancement of Ghanaians to manage the oil and gas sector. Again, it seeks to target training of Ghanaians in high-job creating sectors including wielding, pipe-fitting, fabrication and installation, mechanical, electrical and instrumentation, manufacturing of equipment and construction of oil and gas infrastructure in line with the apprenticeship model. Furthermore, it also seeks to facilitate the capacity building of educational and training institutions and implement standards and certification requirements in the oil and gas industry. Second Lady, Samira Bawumia explained that the Programme is a vision of President Akufo-Addo conceived while he was opposition leader in 2016. She says through the Programme, President Akufo-Addo seeks to ensure an aggressive investment in the skills training and development of Ghanaian youths to take up employment opportunities in the upstream oil and gas industry of the country. It is believed since Ghana discovered oil in commercial quantities in 2017, this is the first an ambitious step is being taken to get many Ghanaians to take up jobs in the sector. Mrs Bawumia seven educational institutions including KNUST, Takoradi Technical Institute, Takoradi Technical University, are to be supported to serve as centers for the training programmes. 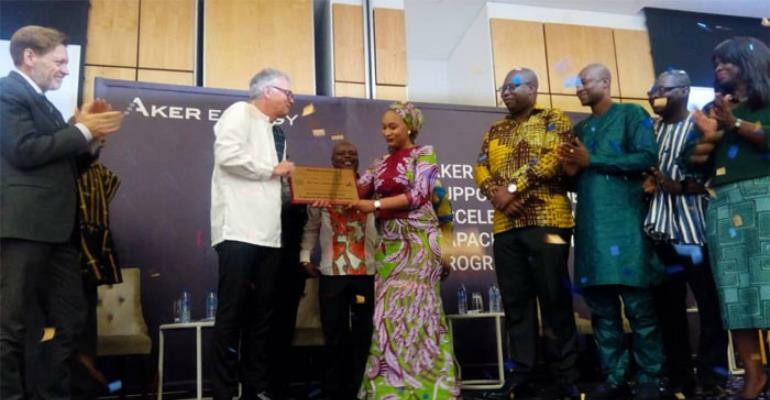 Aker Energy pledged to continue supporters Ghanaians to gain what it described as relevant international qualifications to support the growing industry. It also pledged to further support in developing the capacity of local SMEs and help to create new start-ups. Ghana Country Manager of Aker Energy, Jan Helge Skogen, in a statement to officially launch the support, indicated that Aker Energy will support the Petroleum Commission of Ghana to certify vocational and technical experts, preparing them for jobs in the industry. Under the AOGC Programme, he said, Aker Energy will seek support from and utilize Ghanaian educational institutions to increase competency levels through a training of local trainers programme. Deputy Minister of Energy, Joseph Cudjoe lauded Aker Energy for the support and hoped that it will make positive impact for the industry.